About half of the presidents in American history saw combat in some in each of America's major conflicts. President George H.W. Bush (1924-2018) stands as the last president to see action on the front lines as a pilot in WWII. His service is punctuated by a courageous mission over a Japanese installment in 1944, part of the Allies' crucial island hopping strategy. For many years, military service was almost prerequisite for the nation's highest office. From George Washington and James Monroe, who helped establish the country during the Revolution, to the Andrew Jackson and Zachery Taylor, who kept it alive during the War of 1812. Beginning with General Ulysses S. Grant, an entire generation of presidents helped preserve the country during the Civil War including Rutherford B. Hayes, James Garfield, Benjamin Harrison and William McKinley. Theodore Roosevelt became the only president to win the Medal of Honor during the Spanish-American War for his Rough Riders' courageous charge up Kettle Hill while other soldiers fled. However, by World War II, six presidents had entered the White House with no significant combat experience. However, the war would produce a new generation of men who fought for their country on the front lines only to serve their country again in the nation's highest office. In 1944, World War II was continuing into its sixth year. In Europe, the Allies would launch a massive attack on the French coastline at Normandy. Meanwhile, the Soviet Army would invade the Baltics on their march toward Berlin. In the Pacific, the Allies continued their "island hopping" campaign by capturing Guam and Tinian. At the Leyte Gulf, American and Japanese fleets would face off in what would become the largest navel battle of the war. And later, the U.S. set up their first airbases in the Philippines. It was in this arena that a young pilot, George Herbert Walker Bush, began to distinguish himself as a courageous and skilled tactician in the cockpit. Bush had just turned 18 when he enlisted in 1942 and began training as a pilot for the US Navy. By the time he received his commission, he was the youngest pilot in the Navy. In 1944, Bush was stationed aboard the aircraft carrier USS San Jacinto and assigned to the Torpedo Squadron (VT-51). In June, Bush would see action in the Wake islands and the Marianas Islands, one of the largest air battles of the war. During the battle, Bush would be forced to make a water landing and was rescued by a nearby destroyer. It would not be the first time Bush's life would be in the balance in the Pacific. On September 2, Bush, along with Radioman Second Class John Delaney, and Lieutenant Junior Grade William White, USNR, took off from the San Jacinto intent on attacking a Japanese installation on Chi Chi Jima island. The three were aboard a TBM Avenger, a torpedo aircraft first used in 1942 during the Battle of Midway. Upon arrival, Bush and his squadron encountered heavy fire from anti-aircraft weapons on the island. Bush's plane was hit by enemy fire, setting his engine on fire. He and the other aircraft pushed on, releasing their payload and scoring several hits against the installation. Bush's plane limped back over the Pacific with the engine still on fire. However, it became apparent the aircraft was not going to make it back to the San Jacinto. Bush bailed along with either Delaney or White. The other did not escape the aircraft. However, the man who did bail with Bush was unable to open his parachute and fell to his death. It is not clear whether it was Delaney or White who bailed, but both were killed. Meanwhile, Bush spent several hours on a life raft, waiting for any sign of rescue. Finally, the submarine USS Finback, helped rescue the exhausted but otherwise unhurt pilot. Bush stayed aboard the Finback for the next month, assisting in the rescue of other downed pilots. However, he returned to the San Jacinto to fly in future missions in the Philippines. During this campaign, Bush's squadron would suffer 50 percent casualties. In all, Bush flew 58 missions in the Pacific. Each mission flown by Bush and the rest of the Naval Air Force proved crucial in the island hopping campaign, weakening Japanese defenses and allowing Allied forces to inch closer to the Japanese mainland. Bush was eventually sent back to the United States to train future pilots in Norfolk, Virginia. For his harrowing mission over Chi Chi Jima, Bush was awarded the Distinguished Flying Cross and three Air Medals. Bush's squadron would receive a Presidential Unit Citation for their bravery in the Pacific Theater. Following the Japanese surrender on Sept. 2, 1945, Bush received an honorable discharge from the Navy. While his war days were finally over, his life as a public servant was only beginning. After nearly two decades in the oil business, Bush won a congressional seat in 1966. He served on the House Committee of Ways and Means, where he voted to abolish the draft. Bush would later serve as an ambassador to the UN and director of the CIA. After losing the Republican nomination for president, Bush served two terms as Vice President under President Ronald Reagan before being elected president in 1988. During his one term in the White House, President Bush sought to further improve relations with an old foe across the Pacific. "No nation can fully understand itself or find its place in the world if it does not look with clear eyes at all the glories and disgraces, too, of the past," President Bush said. "We, in the United States, acknowledge such an injustice in our own history: The internment of Americans of Japanese ancestry was a great injustice, and it will never be repeated." Bush secured $20,000 of reparations for Japanese-Americans held in interment camps during the war. On Dec. 6, 1991, Bush formally accepted an apology from the Japanese Prime Minister for the attack on Pearl Harbor in a ceremony marking the 50th anniversary of the attack. Bush believed it was another step in improve the relationship between the United States and Japan. Bush was the last of his generation. Six presidents, Dwight D. Eisenhower, John F. Kennedy, Lyndon B. Johnson, Richard Nixon, Gerald Ford and George H.W. Bush, saw action in the Second World War. Though Bush's son and namesake President George W. Bush was enlisted in the military, no other president since George H.W. Bush has seen any action during war. 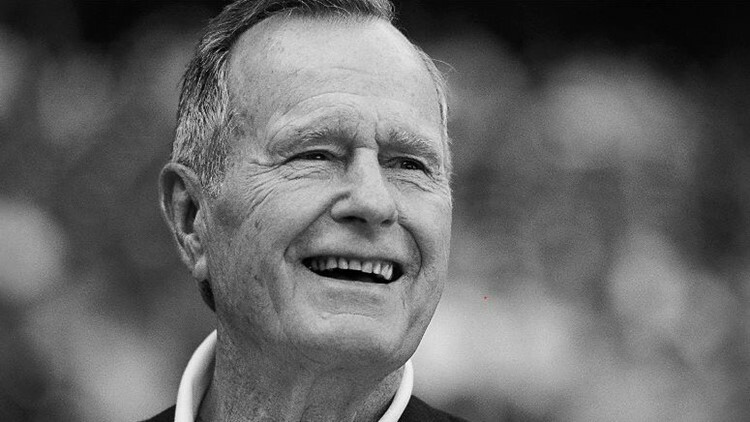 Thus, the elder President Bush is the latest in a inter-generational fraternity of presidents who not only served their country in the White House, but put their lives on the line serving on the front lines to protect the very country and people they would serve.